A colorful and savoury herbed rice pilaf with carrots, red bell peppers, corn, and peas makes a great side dish to any meat dishes but it can also be hearty enough for a meal with the addition of chicken or pork. This can be served as a light meal with some Greek yoghurt. In Cyprus we make Pilafi me Fide, which is a rice pilaf with vermicelli pasta, raisins and pine nuts. When I make it for the family, I don’t add the pine nuts or raisins as some of them don’t like them. At the time of making this pilaf, I only had some frozen artichokes and a mixture of other frozen vegetables (peas, corn, peppers). However, since then, I have made this recipe many times with different fresh vegetables. At the end you will fin a new recipe with a video, using mushrooms in the pilaf. Steam the vegetables or boil them until soft and set aside. In a non-stick sautéing pan toast the pine nuts but be careful not to burn them. Remove to a plate. In a large skillet or sauce pan, heat the olive oil and butter and sauté the onion until translucent. Add the garlic and mix until fragrant. Break the vermicelli nests into smaller pieces and sauté them as well for a few minutes until they begin to brown. Add the rice and sauté a few minutes to coat with the olive oil. Add the chicken broth, salt and pepper, cover with the lid and simmer for 15 minutes, mixing every now and then. Mix in the vegetables and cook for another five minutes. Add the raisins and pine nuts and mix. If you want to mold the rice, mix in some more butter, so that the rice holds together. During the holidays, I made this pilaf with fresh mushrooms, which I love and I added some walnuts and raisins and some spices in it, which makes it delicious. This Easy Rice Pilaf with Mushrooms is perfect for a festive dinner as it is tender, fluffy, and flavorful. It’s the perfect side dish to accompany any meal, anytime. I served it with Curry, which I made with leftover turkey. Boil rice, according to package instructions, drain and set aside. Simultaneously, heat the olive oil and sauté the green onion. Add the spices and mushrooms and sauté until they wilt, mixing for a few minutes. When the rice is cooked, drain and add the butter, the mushrooms, the sweet peppers, the walnuts and raisins and mix. If using a mold, unmold and sprinkle some paprika on top. A smilar recipe is included in my cookbook Mint, Cinnamon & Blossom Water, Flavours of Cyprus, Kopiaste! And hey… great now look for your blog. Looks so good! Aww thanks for the award, Ivy. I have a lot of quirks. LOL. This pilaf looks delicious. I love my pilaf with vermicelli, too. There are so few things better than a nice pilaf with vegetables. You’ve got me craving some. “pilafi” as we say is delicious in any form as far as I’m concerned. This is quite an interesting recipe Ivy with the addition of “fide”…mmm. Congratulations on your award and thank you (again) fo another award! I am lovin’ that rice Ivy – especially the fact that you took the trouble to mould it for the picture. Very nice pilaf indeed and I do like the addition of veggies. What a cute meme! Thanks so much for doing it so quickly! You are the first to finish it. Congratulations on both of your awards. Great job. What can we say – many thanks for the award. It’s so good to be recognized in a jury (kinda dramatic no?) of one’s peers. The pilaf has a twist – I love that – the vermicelli must give it some crunch when you fry it. I could just eat it as a main. The new site is really coming along and looks terrific. Just one complaint – the music is so soothing, I didn’t want to leave and was kind of upset when the massage person didn’t show up. It’s so spa music. Hi everyone and thanks for coming over to comment. We passed on to winter just like that no fall in between. Last week it was 30 degrees and today its 15 degrees. Giz, I just wanted to tell you that the massage is on the house. Imagine me rubbing your shoulders and back, aaaah, how relaxing it is. I am glad you liked Vangelis’ Papathanassiou music. I’ve added music in the past but whenever I heard it more than twice a day it got onto my nerves. I really love this music as well. You are the first one to tell me about the music and I didn’t know if you could hear it while commenting. Thanks very much. Hi Ivy! It’s been a while since I’ve visited, and I came over to see how you’re doing. I feel like I’ve just come to your house after not seeing you for a bit…kopiaste, for real. 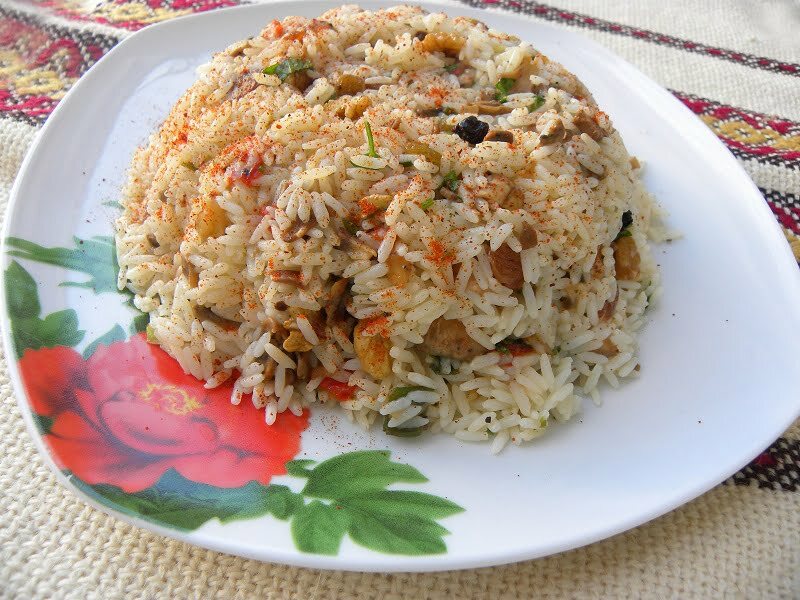 I am hungry now, this pilaf looks very very delicious. Rice pilaf looks delicious… adding vermicelli to it is new to me… But I guess taste of the combo will be good. Thanks for the award, Ivy. Giz and I have already decided to share the meme. I’m going to star this pilaf, I need to “spice up” my regular boring rice. That is a delicious looking pilaf Ivy! I love the vermicelli in there! i request you to post the links of your recipes that u have contributed for the event or wish to contribute in future, in the comment section of this particular event announcement page. i highly appreciate your cooperation and participation in the event! Thanks again to all of you for your lovely comments. Glad you liked my recipe. Mmm pilaf. I make a similar one. Great pilaf recipe…never heard of a vermicelli one! YUM!! Nice to see you here Kang. I’m a rice addict and seeing your pilaf rice up there makes me salivate… MMmmm. I’ve never tried adding vermicelli to a rice pilaf before but it does sound like a good idea, which I will try soon. This rice dish looks very delicious, great flavors and it seems pretty healthy as well! Wow, this is a fantastic side dish but as you say I am sure it is great just on its own as a light meal! Wow rice and vermicelli sounds something new and looks gr8. I will try my hands on this soon. Thank u for joining the event. Nice to learn another vegetarian recipe. Will definitely try it. First time here. Thanks for this wonderful recipe. Have a question? How do you mold this recipe? The presentation is very nice. Sue, it’s a Tupperware mold. Hi, i'm sorry but i can't find the recipes, when i click on the name of the recipe only the pictures come up, am i doing something wrong? I am not sure what is wrong. Check back in a while.